The determination of average com weight as a measure for malting quality. The determination of the percentage of cells in a yeast culture which are respiratory deficient (known as “petite mutants”, or simply “petites”). Descriptors: detection and enumeration of respiratory deficient mutants, deficiency in metabolism, low yield of biomass, diacetyl formation. The determination of the percentage of living corns and pregerminated corns in a sample of barley using a rapid staining technique. This technique allows the prediction and evaluation of the stability of brewing characteristics in a strain of yeast, and also permits the study of the influence of certain technological parameters on its behaviour in fermenter. It can also be used to assess the characteristics of newly isolated yeast cultures. Descriptors: yeast characterisation by fermentation in EBC Tall Tubes. The determination of the percentage of living corns in a sample of barley using a hydrogen peroxide assisted growth test. Classification of yeast isolates according to their ability to flocculate or form flocs. Descriptors: Gilliland Method, yeast analyis, aggregation of yeast cells. Classification of yeast isolates based on their ability to flocculate or form flocs and to de-flocculate. Descriptors: Hough Method, yeast analysis, determine the flocculation characteristic, appearance of yeast suspensions. Classification of a suspension of yeast based on its rate of flocculation. Descriptors: Helm Method, sedimentation of yeast, calcium sulphate solution, yeast analysis. The measurement of the percentage of grains which can be expected to germinate fully if the sample is malted normally at the time of the test. The determination of the percentage of grains which can be expected to germinate fully if the sample is malted normally at the time of the test. The estimation of germination percentage and germination rate of grains which can be expected to germinate fully if the sample is malted normally at the time of the test. Estimation of the percentage of pre-germinated grains in harvested barley. Estimation of the percentage of pre-germinated grains at the time of harvest. The object of this test is mainly to obtain an appropriate percentage of the kernel weight that does not contribute to extractable matter. Determination of the total mixed linkage (1,3)(1,4)-ß-D-glucan (ß-glucan) content of barley. The determination of kernel size and evenness. The determination of the percentage of damaged barley kernels, which may deteriorate malt quality. The determination of the barley variety(ies) in a barley sample by acid polyacrylamide gel electrophoresis. The determination of moisture and protein content in barley by near infrared spectroscopy. Qualitative detection of microorganisms present and able to grow in wort. Descriptors: wort forcing test, detection of contaminants in wort, haze and CO2 development. This document deals with methods for sampling malts. Quantitative detection of aerobic and facultative microorganisms in wort. Descriptors: general aerobic count, aerobic incubation, growth, Plating method, partially selective or non-selective. Quantitative detection of Enterobacteriaceae in wort. Descriptors: selective media for the growth of Enterobacteriaceae, aerobic incubation. Quantitative detection of lactic acid bacteria in wort. Descriptors. contaminants, differentiated into rods or cocci, incubation. It is necessary to use EBC Method 2.3.3.2 and 2.3.4.3 or 2.3.4.4 and 2.3.5.1 or 2.3.5.2 or 2.3.5.4 and 2.3.7 and 2.3.6.1 or 2.3.6.2. Detection of bacteria in yeast or fermenting beer by the addition of growth medium to the sample. Descriptors: enrichment, concentrated medium, growth of contaminant microorganisms. Quantitative detection of aerobic and facultative microorganisms in samples where brewer’s yeast is present, for example, yeast slurry from storage vessel, fermentation samples, beer for cask racking, beer in cask, bottled conditioned beer, etc. Descriptors: General Aerobic Count on Samples of Yeast or Fermenting Beer, aerobic incubation, Plating method, cycloheximide, counnt colonies. The determination of the moisture content of all malts by loss in mass on drying under specified conditions. 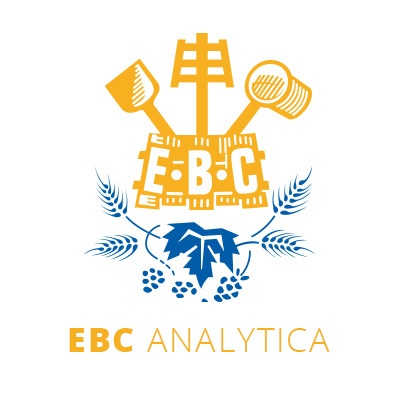 The ISO Method for moisture content of grain (ISO 712-1985) which is used for barley (EBC Method 3.2) must not be used for malt as the conditions of drying are such that chemical condensations occur in which water is formed as a product of reaction. Descriptors: general anaerobic count on samples of yeast or fermenting beer.